Artist Jewelry by Chris Steenbergen silver and gold brooche: Description by Adin Antique Jewelry. This 14K yellow gold and silver brooch from 1972 by the well-known Dutch contemporary jewellery artist, Chris Steenbergen, serves as a collectible piece of future antique jewellery. This design illustrates interplay of contours in the shape of a square outer line, a circular negative inner space and an oval profile. Being an example of minimalistic abundance, this jewel is a wearable statement. This particular brooch is pictured on page 36 in the catalog of the Museum Boijmans Van Beuningen, Rotterdam, Netherlands, named 'Chris Steenbergen, goldsmith' published in 1985. 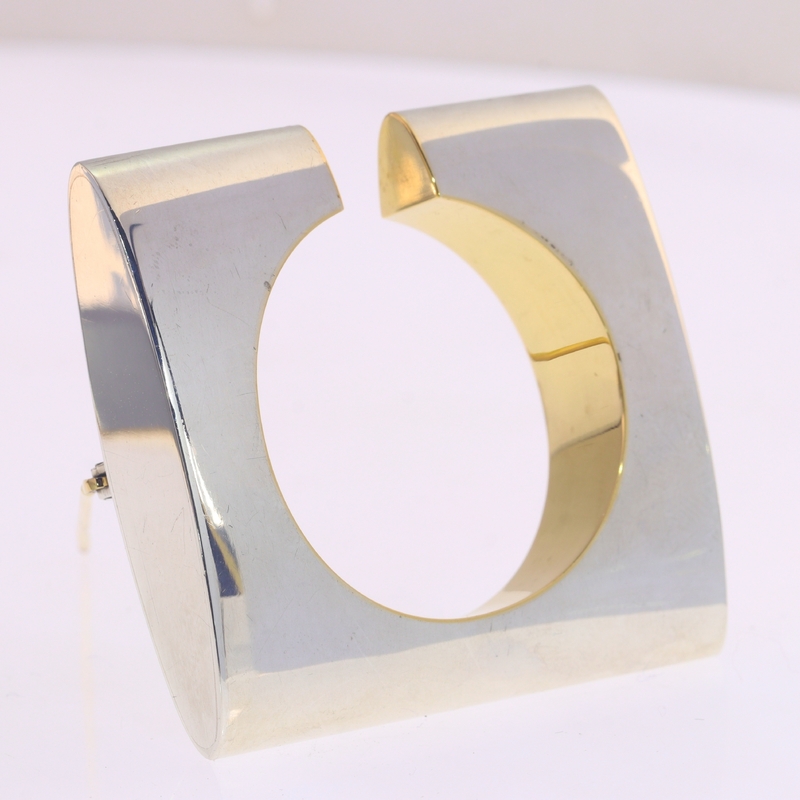 Material: 14k yellow gold and silver. Hallmarks: The Dutch control mark representing an oak leaf with the number 585, for 14K gold, that is in use since 1953. And the Dutch control mark representing a sword with the number 925 for silver 925 (Sterling silver). In use since 1955. And no master mark of Chris Steenbergen.